“The head of a lamb and the heart of a lion”: So goes a common and apt descriptor of that one-of-a-kind-looking dog from the north of England, the Bedlington Terrier. This elegant, well-fleeced, somewhat extravagant creature has inspired human fandom since the early 1800s, and across this history has been everything from a scrappy laborer’s companion to a primped-up show-ring champion. Today, the Bedlington serves as the faithful, friendly, and boisterous household buddy of a relatively small but partisan share of everyday dog-owners. The Bedlington hails from the county of Northumberland, home to the breed’s namesake town (whose National League football club is still called the Bedlington Terriers). The breed arose in the late 18th and early 19th centuries from a general category of hunting dog loosely called the Rothbury Terriers. The Bedlington is widely thought to share common lineage with the Dandie Dinmont, the Soft-coated Wheaten, and the Kerry Blue terriers; the Bedlington Terrier Club of America suggests that, of one strain of Rothbury Terrier, the short-legged variety became the Dandie Dinmont and the long-legged one the Bedlington. A dog named Piper was apparently the first to be formally called a Bedlington Terrier, back in 1825. These active and lithe terriers were prized among the miners of Northumberland for their pursuit of vermin and game: from catching rats in the mineshafts to boldly hunting such formidable quarry as badgers and otters, the latter which they could adeptly chase in the water. Likely cross-breeding with Whippet gave the Bedlington its distinctive gracile, arch-backed form, which enhances its speed and agility. As the American Kennel Club notes, the Bedlington began its existence performing multiple roles in the hardscrabble coal country of its origin: not just ratting and hunting, but also pit-fighting, another activity for which their tenaciousness and spitfire grit were well suited. But it didn’t take all that long for this feisty working dog to attract the attention of British high society: By 1877, England’s National Bedlington Terrier Club had been formed, and the breed’s lamb-like look entered the high-maintenance show-dog realm. 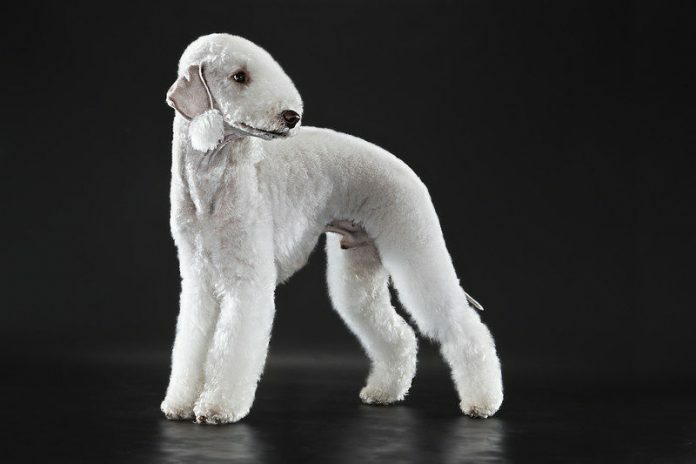 A lamb is indeed the first thing that comes to mind when eyeballing a well-kept Bedlington Terrier, from the plush topknot to the gangly, woolly legs. Among this sharp-looking breed’s hallmark features are the thick ruff atop the lean, long head and muzzle (lighter in color than the body); the tasseled ear tips; the arcing body line with a pronounced “tuck-up” of the belly; and the coat, which the official American Kennel Club breed profile describes as “a very distinctive mixture of hard and soft hair standing well out from the skin.” The springy, spongy feel of that fur is commonly called “linty”; in fact, among various Bedlington nicknames (such as the archaic “Gypsy Dog” and simply “Rothbury Terrier”) is “Linty-haired Terrier” – maybe not the most appealing of labels. The Bedlington’s hindlegs exceed its forelegs in length; all four are muscular and sturdy. The tapered tail is “scimitar-shaped” (American Kennel Club). Bedlington Terriers are usually white, liver-colored, or blueish, or a mixture. Dark-haired puppies tend to turn lighter as they mature. The Bedlington stands some 15 ½ to 16 ½ inches at the withers, and usually weighs between 17 and 23 pounds. Bedlington Terriers have a winning personality: affectionate and loyal, more laidback than your average terrier but also wonderfully athletic and up for adventure. Great with children, Bedlingtons also typically get along well with other dogs if they’ve been socialized at an early age. With careful conditioning they can also normally cohabitate with small animals, though outdoors they’re apt to express their original breeding by giving swift chase to any they come across. Ensuring your Bedlington gets plenty of exercise and mental stimulation will help ward against boredom and the resulting expression of pent-up energy in potentially less-than-desirable behavior. As their long-ago facility as pit-fighters and otter-hunters suggests, Bedlington Terriers certainly aren’t afraid of a scrap, even one up against a much larger or heftier dog. A well-socialized Bedlington, however, is unlikely to go picking fights–only defending itself vigorously if need be. Bedlington Terriers are effectively a non-shedding breed: Their loose hairs tend to snag within the coat rather than drop. That sheep-worthy fleece does require regular brushing or combing, though – a few times of week – and clipping every couple of months. Maintaining the demanding “show clip” – a body coat an inch or less thick – is time-consuming, meticulous work, but fortunately that’s not a standard most pet-owners worry about. Bedlington Terriers live an average of 12 to 14 years. All things considered they’re a fairly healthy breed; the chief concern is the hereditary and often fatal liver ailment called copper toxicosis, which is characterized by a buildup of copper in the liver. Bedlington Terriers can also be prone to various eye problems, including distichiasis (the growth of hairs on the inner eyelid) and progressive retinal atrophy (a hereditary, incurable disease eventually resulting in blindness) as well as cataracts and complications of the tear ducts. Genetic testing can help clue you in to whether your Bedlington may suffer from copper toxicosis, progressive retinal atrophy, and other inherited diseases. Obesity is also an issue to watch for with Bedlingtons: Closely monitor your dog’s food intake and make sure it’s getting plenty of hearty exercise. Speaking of which: While Bedlington Terriers will readily lay around with their owners, R&R-style, that best comes on the heels of some vigorous daily workouts: These are hunting dogs, after all, fast runners and enthusiastic swimmers. Give them playtime in a fenced yard, and keep them leashed on walks so they’re not hightailing it after every squirrel, cottontail, or housecat they flush. Bedlington Terriers are smart dogs with a bit of a stubborn, individualistic streak. They respond well to early, firm, positive-reinforcement training. Follow a dedicating training program that clearly establishes who’s boss, and you’ll likely end up with a very well-behaved and loyal lion-hearted lamb of a dog.